On March 13 1999, Nothing Really Matters spent the first of two weeks at #1 on Billboard’s Hot Dance/Club Play chart in the U.S. Despite being a successful club hit, many have cited Warner’s unusual marketing choices for the single as the primary reason for its poor placement on the Hot 100, where its peak of #93 remains the lowest of her charting singles. The delayed release of the commercial single – which came long after the song had peaked at radio – was clearly a blunder, while other aspects of the song’s promotion seemingly started too early. After declining to release the experimental remixes for The Power Of Good-Bye in the U.S. (the remixes were issued commercially in Canada & abroad), Warner jumped the gun by beginning to service remixes of Nothing Really Matters promotionally to clubs as early as September of 1998 – over six months ahead of the maxi-single release. An alternative might have been to service the Sky Fits Heaven remixes promotionally in the U.S. during the interim, considering that it managed to enter the Dance/Club Play chart based solely on spins from the imported Drowned World/Substitute For Love single, with no push from the label domestically. 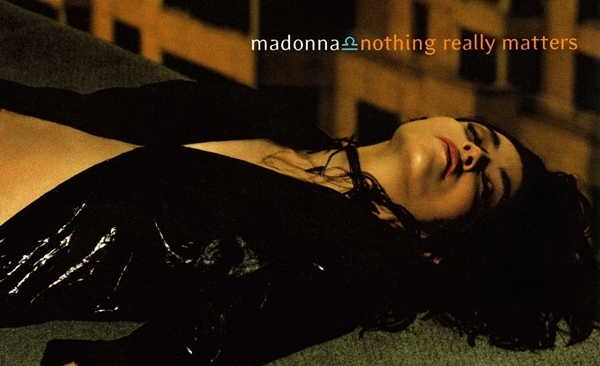 Chart positions and marketing decisions aside, the maxi-single for Nothing Really Matters, with its wonderfully varied set of remixes by Peter Rauhofer, Kruder & Dorfmeister and Talvin Singh, remains one of Madonna’s best, in our opinion. Together with its visually stunning music video, the single marked an artistically pleasing closing chapter to the epic Ray Of Light era. One of my all time favorite maxi-singles by her! She was very on-the-nose with the producers for the remixes. Talvin Singh and K&D were hitting their peak on the electronic (Drum & Bass, Downtempo) scene. The best is on the K&D remix when her vocals “Nothing takes the past away like the future” sounds like it’s coming out the speakers and travelling around the room!!! 3-D sound! I agree! The K&D mix of NRM is one of my favorite remixes of all time! It’s pure bliss – and a true work of art in its own right. One of these days I’d really like to get around to attempting to create a remix video to accompany it. The only reason I haven’t is because I think the original remix video footage would be too busy to suit the more laid back vibe of the mix. A lot of the original video footage would be difficult to use as well since so much of it consists of lip-synching shots while the remix only focuses on a few lyrical strands. I’ll have to keep thinking on it for now. Brilliant Remix of an underrated near-hit!!! Nothing Really Matters is a beautiful song by Madonna and it just might be her apex with her friend Patrick! Ray of Light’s linchpin centerpiece, the song is an artistic statement for her kids-being a mother to the kids is the best reward, reinvention and role of all for Lady Madonna! I WILL NEVER FORGET Nothing Really Matters! Screw Radio, Madonna is only in it for Art!